Below is a list of additional settlements and jury verdicts and settlements with involving USAA. You can find the original list of cases, many of them Miller & Zois', here. We generated this list from a variety of sources, including our law firm's own settlements and verdicts with USAA, here. That list certainly had better outcomes than this one. But, again, and our list of settlements underscores this, USAA is generally trying cases where the plaintiff's lawyer has misvalued the case. If you have a good case against USAA, they will typically make a reasonable settlement offer, particularly after suit has been filed, discovery is complete and the adjuster can fully evaluate the case. Based on their use of Colossus and our own history, we also believe that USAA pays more on cases where the plaintiff is represented by experienced counsel with a good track record. In other words, we think USAA is smart enough to know some accident lawyers settle virtually every case and make an offer consistent with this unwillingness to file suit. 2013, Frederick County: $1,000,000 Settlement. An adult male dies after his vehicle is crushed by a vehicle being operated by defendant driver who loses control of his vehicle, crosses the center median, becomes airborne, and lands on the roof of plaintiff’s vehicle. His estate alleges that the defendant driver failed to maintain adequate and proper control of his vehicle and that he was the proximate cause of the plaintiff’s death. USAA contributes $100,000 as the defendant’s insurer, and the defendant’s employer contributes a total of $700,000 to plaintiff’s wife and children. USAA and the employer are ordered to pay the remainder of the $1 million settlement for plaintiff’s attorney’s fees. 2012, Maryland: $27,500 Verdict. The plaintiff is attempting to cross four lanes of traffic at a crosswalk when he is struck by defendant’s vehicle. Plaintiff suffers scarring on the back of his forearms and a tibial plateau fracture. Plaintiff alleges that vehicles are supposed to stop for pedestrians while defendant claims that the victim was comparatively negligent. A Montgomery County jury awards the plaintiff a surprisingly low verdict, given these injuries. 2011, Maryland: $15,000 Verdict. A plaintiff is driving when a defendant driver runs into the rear of her vehicle. The victim suffers a closed head injury, cervical and lumbar strains, and multiple contusions and abrasions. The plaintiff claims that the driver operated the vehicle in a negligent manner and that she was entitled to uninsured/underinsured motorist coverage. Again, a Rockville jury awards the plaintiff a low verdict in a USAA case. 2011, Maryland: $2,256.44 Verdict. Plaintiff is stopped in traffic when defendant rear ends him. Plaintiff complains of injury to his back and damage to his vehicle. The plaintiff seeks $2 million in compensation for injuries, medical expenses, and paint and suffering. Plaintiff later amends his complaint to include USAA for uninsured/underinsured motorist benefits. The court dismisses the claims against USAA, but the jury awards the victim $2,256.44 for past expenses. 2010, Maryland: $49,000 Settlement. A pedestrian is leaving BJ's Shopping Center and is hit in thepedestrian crosswalk by a driver who put the car in reverse. She suffers a broken wrist that heals well. Our firm settled this case. 2010, Maryland: $75,150 Verdict. Plaintiff, a clerical worker in her mid-40s, is rear-ended while stopped for an emergency vehicle. Plaintiff is traveling with two vehicles behind her, a USAA insured driver immediately behind her, and a MAIF insured driver behind the USAA driver. Plaintiff stops at a green light for an approaching vehicle. The USAA driver swerves to avoid the collision, but the MAIF driver fails to stop in time and rear-ends the Plaintiff causing her neck, back, and shoulder injuries as a result. Plaintiff undergoes shoulder surgery. Defendant contests Plaintiff’s shoulder injury as she did not immediately present for shoulder complaints. Plaintiff claims approximately $18,000 in special damages and a jury awards her $75,150 in damages. USAA's driver is not responsible. 2010, Maryland: $85,865.24 Verdict. A motorist runs through a stop sign and collides with plaintiff’s vehicle. Plaintiff sues his carrier USAA, seeking to recover underinsured benefits. Plaintiff offers to settle for $250,000 while the insurance company offers $5,000. Instead, a Prince George’s County jury awards $85,865.24. 2010, Maryland: $83,000 Settlement. Three vehicles are traveling down I-70 in Howard County near the Route 29 interchange (which is a tough jurisdiction for plaintiffs and USAA knows it). Traffic slows. The third vehicle in line rear ends the plaintiff who hits the truck in front of her. She suffers a hematoma on her leg which led to a complex fluid collection in her leg that needed to be drained. USAA's initial offer is $26,000. We file suit and after few months of discovery, the case settles for $83,000. 2010, Maryland: $30,000 Verdict. A male plaintiff suffers protruding discs with radiculopathy and cervical, thoracic, and lumbar strains when he is rear ended. He attempts to recover through his underinsured motorist coverage. Defendant insurance company denies liability and argues the extent of the victim’s injuries, but a Rockville jury awards $30,000. Our lawyers have successfully handled hundreds of cases involving USAA. Most of them have settled but many have gone to trial. 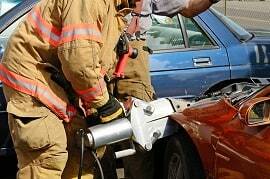 If you have a car crash claim, call us at 800-553-8082 or get a free on-line claim evaluation and consultation.